Acting as a companion piece to Peter Braatz' lyrical dream-like BLUE VELVET REVISITED, Jon Nguyen and Jason S's DAVID LYNCH: THE ART LIFE is a much more straightforward documentary biopic. 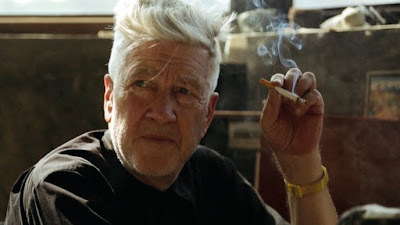 It takes the form of extensive interviews with David Lynch complete with archive photos and videos, set against footage of him making his art today. It is Lynch's voice that tells his own story, apparently as a kind of video diary for his youngest daughter, who we see sitting on her father's lap in his studio. The resulting film is measured, patient, as one would expect form this director, but also deeply honest. Lynch recalls how his elegant but aloof mother identified something special in him from an early age, and his guilt at letting her down with his hatred of studying and going off the rails as young man. We hear how contingent his career was - that he happened to meet a kid whose father was an artist and realised that this was a thing you could actually do - and then the crucial offer of a place at the AFI Conservatory, where he made ERASERHEAD. There's something fascinating in Lynch's need to compartmentalise his life - family, arthouse crowd, lovers - and we get glimpses of his fascinating with the macabre in a trip to the morgue. The movie is also occasionally very unintentionally funny - such as when Lynch lambasts the horror of going to live in Philadelphia. But viewers looking for an analysis of his artworks of films will go wanting. This movie is very much a documentary with its firm focus on formative experiences. To that end, I found it a little disappointing or rather limited in its scope. DAVID LYNCH: THE ART OF LIFE played Venice 2016. There are still tickets available for the Monday 10th October screening at the BFI London Film Festival, where the movie is in the Documentary Competition.